The last couple of days have been spent in Shanghai, home to the Oriental tower and markets full of cheap western goods. We arrived on Sunday night and ate in Grandma’s House (a Shanghai favourite); on the menu were shrimp with garlic and ginger, pork belly in soy and sugar, chicken with ginger, a soup made of ham and tofu, and of course rice. Afterwards we went down to the river and saw the most amazing views (see below). 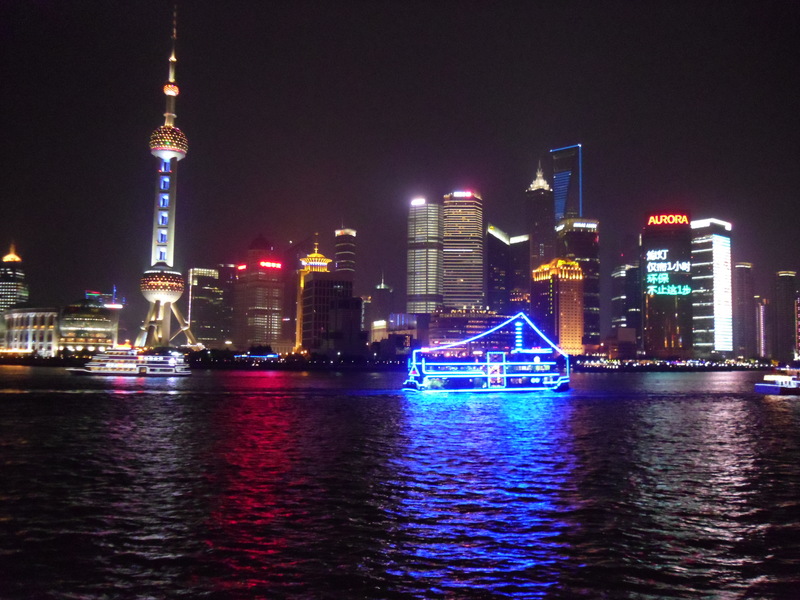 Shanghai looks spectacular at night and I was lucky enough to spend an hour walking down the river before they turned off the lights (I imagine the GDP of a small country would be needed to keep them on all night). Regrettably, the next day I fell ill, and after a night spent shivering in my hotel room I did not feel like walking round the city. However, after my insistence that I was in fact dieing (in true manly fashion I suggested I was suffering from a new super flu) we decided to soldier on. It was suggested that I should try ginger and coca-cola, a traditional chinese remedy thought to help with colds / man flu. Being an educated person with an interest in science I prefer cold hard pharmaceuticals, and so politely declined the offer. Drugs, contrary to popular belief kids, are not bad. 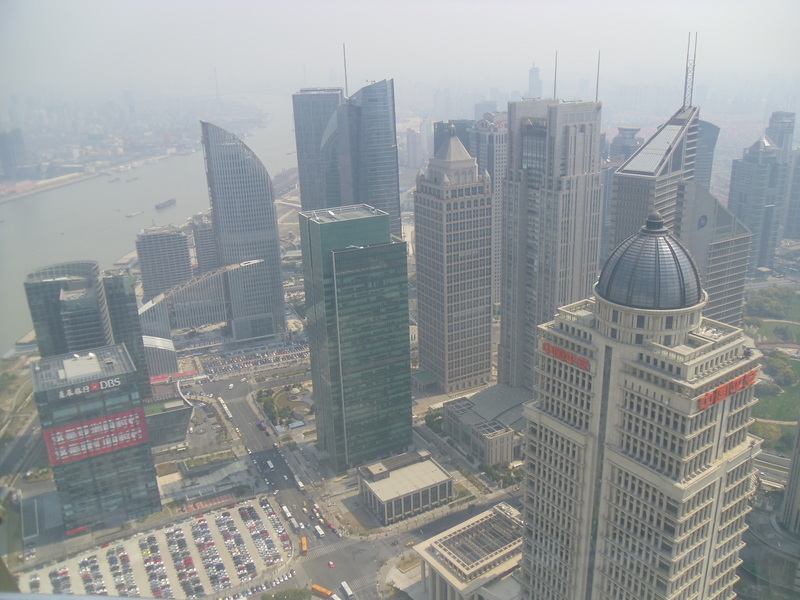 During the day we went up the Oriental tower, perhaps the most widely recognised building in Shanghai. For the generous price of £15, we were allowed all the way to the top in the ‘space capsule’ and even got to ride on the rollercoaster they have in the middle. Afterwards we ate in a Japanese restaurant in the middle of the financial district, nestled in between HSBC (easily the tallest building I have ever seen) and Citi group. You can taste success in the green tea. During the journey home I also had another first – watching a man take a dump (swings and roundabouts). This is a little strange, so I shall explain further. In public toilets in China there is a trough, a cubicle with no door and a flush system that is essentially a toilet attendant with a bucket (you are allowed to use toilet paper, but only if you provide your own). When you feel less than perky this is obviously not the most appropriate thing to witness (is it ever?). When you encounter these scenarios you just have to laugh, there is nothing else to do!. Although in a country like China, with so many bright and intelligent people, I still think it slightly strange that nobody has said – “Wow. This is MENTAL. Let’s just do stuff normally”. I had my first teaching lessons today but I shall update on those tomorrow. Good Night! Regard the toilets, I’ve spoken to some Chinese people before who try and claim it’s more hygienic, because by squatting you avoid touching toilet seats etc… Clearly not more hygienic though. Rank.